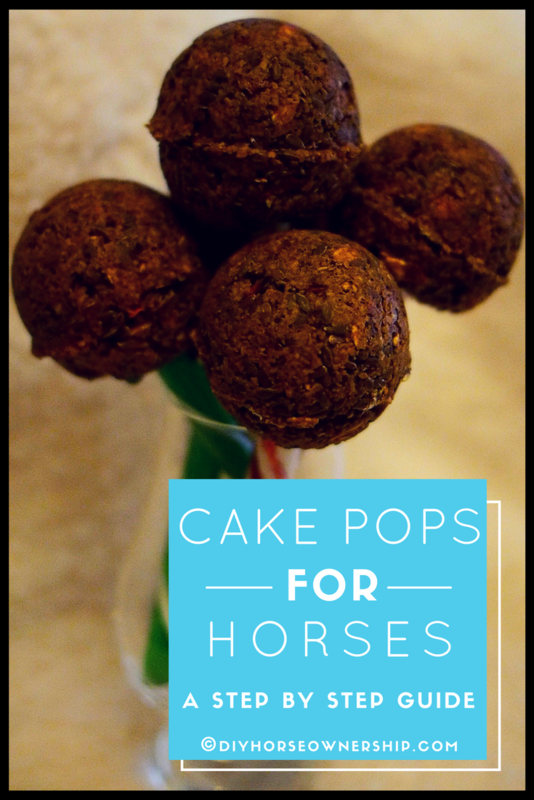 I was making cake pops (for people) the other day and I wondered if cake pops for horses were a thing. A brief search of the internet revealed nothing, so I decided to invent them. 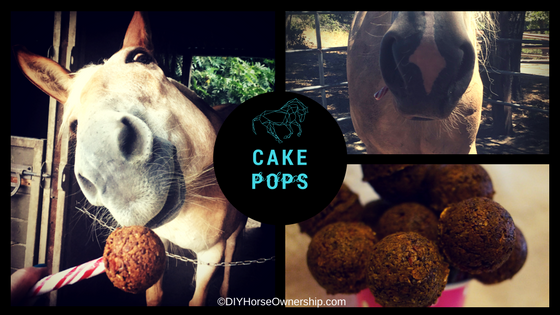 Because cake pops are delicious and horses deserve to enjoy them too. Preheat your oven to 300°. 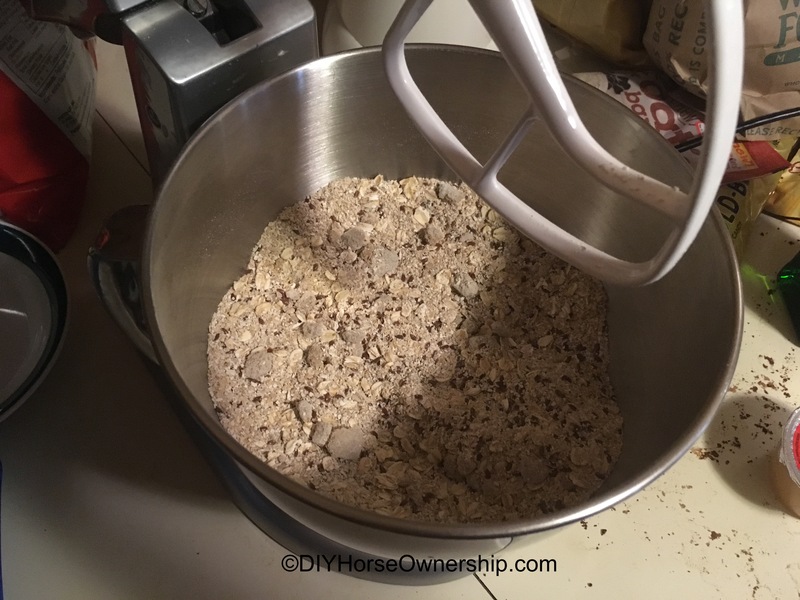 Mix your dry ingredients. 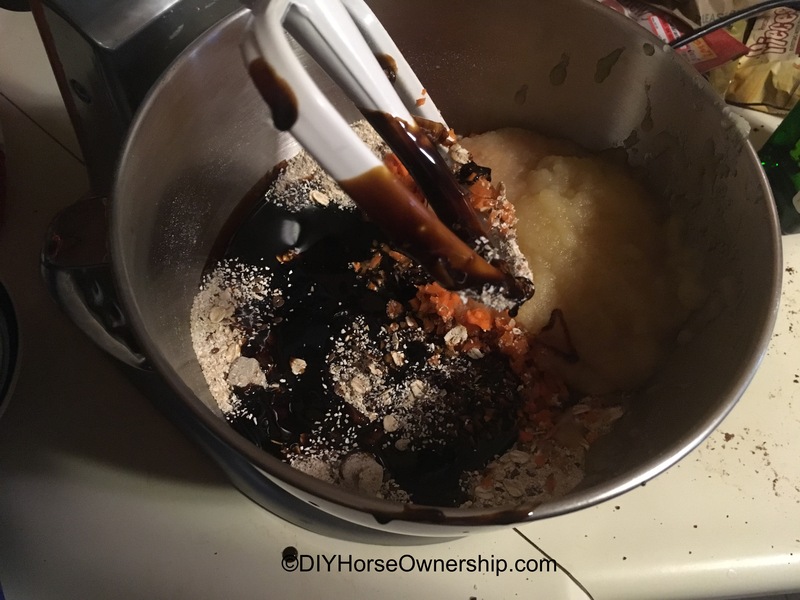 I use a KitchenAid mixer, but you can do this recipe with a spoon and a bowl, it’s very easy to mix and doesn’t require beating. 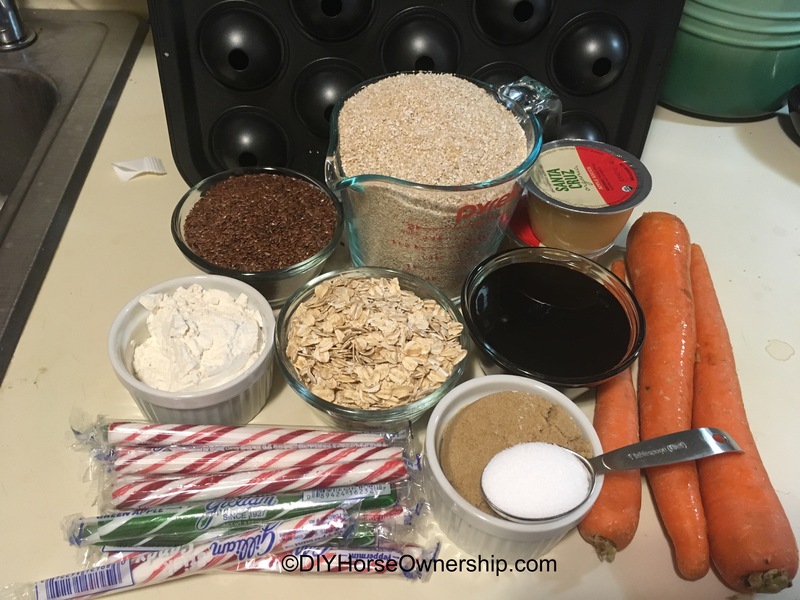 Mix in the wet ingredients and your chopped carrots. 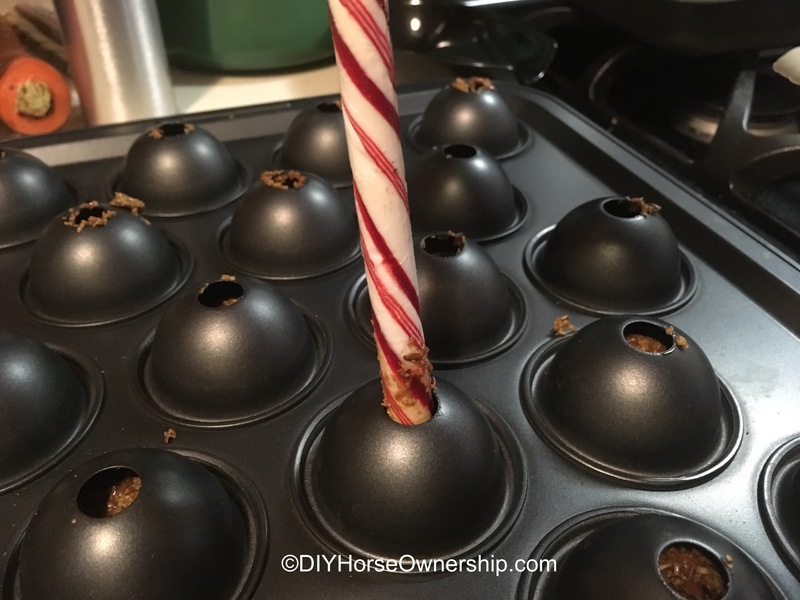 If you have a metal cake pops pan, spray it with cooking spray before filling. 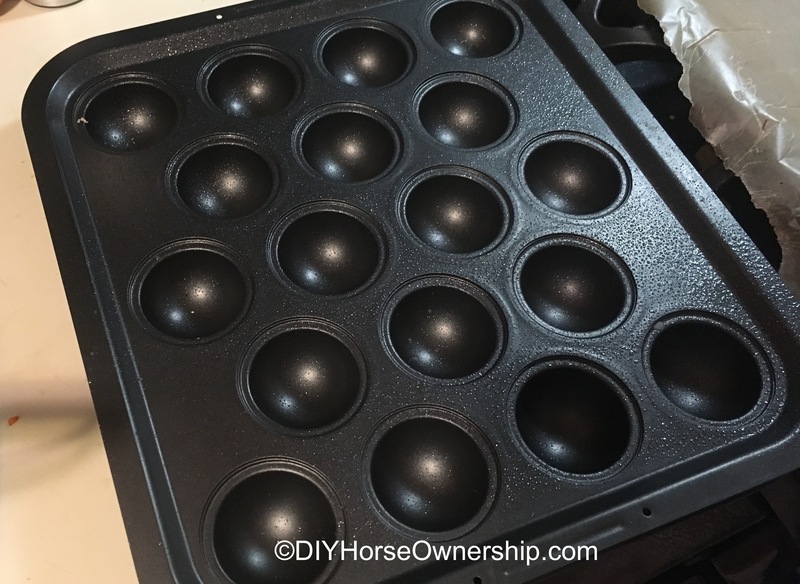 If you have a silicon pan, you can skip spraying as you’ll be able to pop the treats out. Fill both sides of the pan. Make sure to slightly under-fill the side with the hole. You need room for the candy sticks. Flip the hole side of the pan on top of the non hole side. Use just one candy stick and poke it into every hole making a space for the stick. You’ll cook the cakes without the sticks inside them, but you want the hole to be in the cakes in advance. Bake for 1 hour. 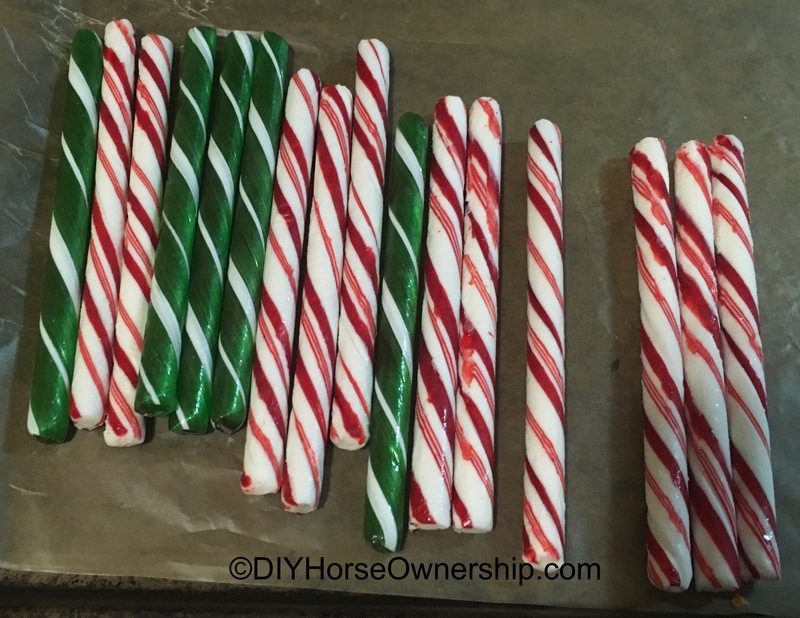 Wile the pops are baking, take time to remove the wrappers from the rest of the candy sticks. After 1 hour, remove the pops from the oven and carefully remove the top tray. Let the pops sit for 10 minutes before you insert the candy sticks. This is important; if you don’t wait, the sticks will melt too much. However, if you wait until the pops have fully cooled, the sticks won’t melt enough to adhere to the cakes. Let the sticks sit upright for another 15 minutes before you pull the pops out of the pan and place them on a cooling rack to finish cooling. You may need to straighten the sticks a bit during this time. I didn’t get a picture of this stage, but I stacked two cooling cooling racks to allow the sticks to hang down below the pops and keep them straight while they cooled. 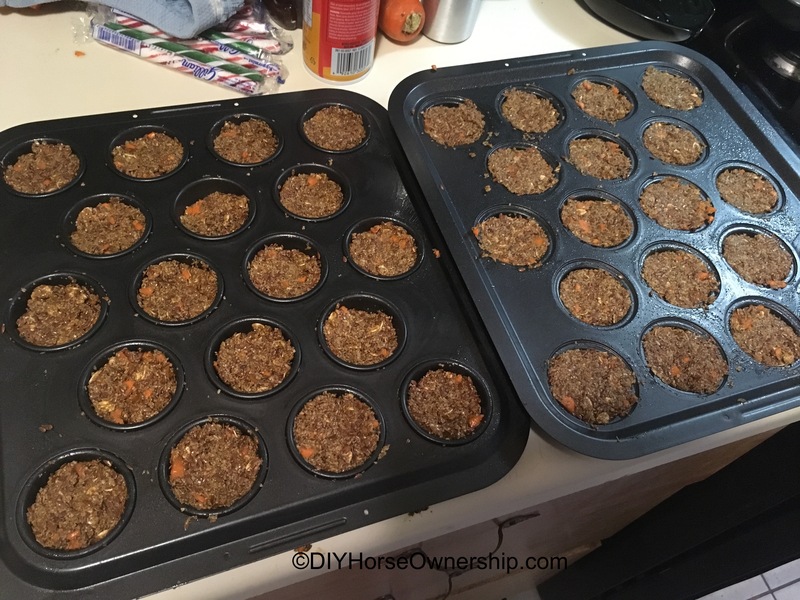 I’ve tried these treats on a wide selection of horses and mules (I even brought them to a group horse camping trip last weekend) and every horse has loved them. In addition to being delicious, they’re pretty easy to make. Those look great! You lost me at cake pop pan though. I didn’t even know they made those. I didn’t either. My friend got one at a thrift shop so I borrowed hers. So cute! Why does my horse have to be allergic to oats, carrots and flax?! He would love this! Those are tough things for a horse to be allergic to. These are so cute! 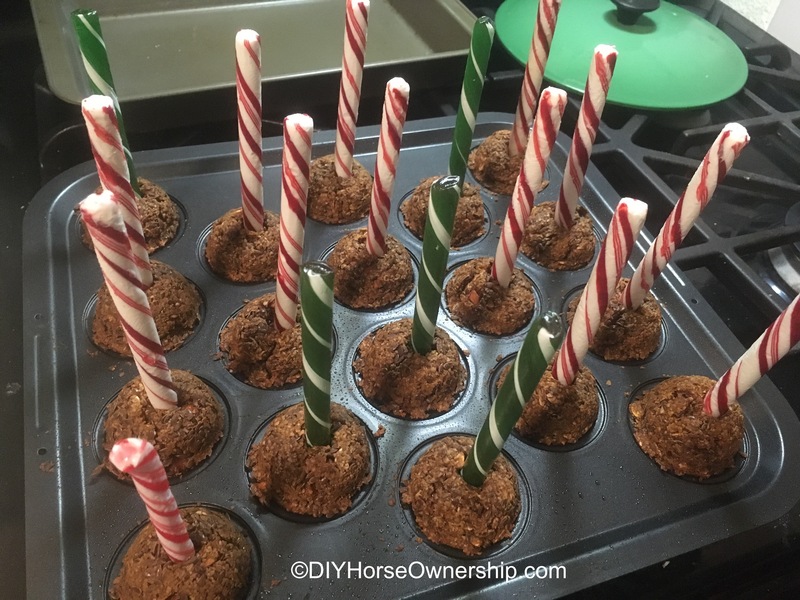 I bet the horses LOVE them! 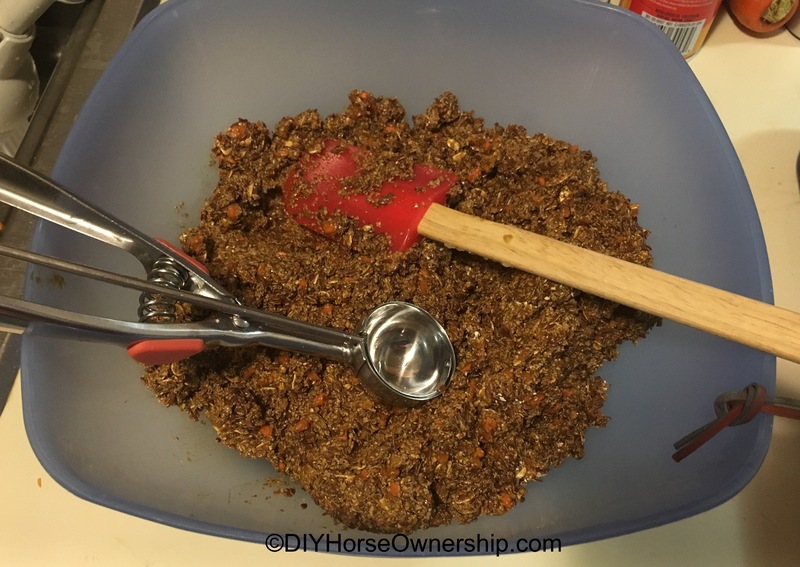 My horse wants to live at your barn and be a taste-tester! yum! 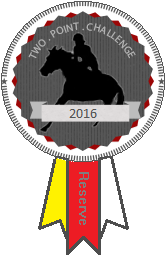 I proclaim you the Martha Stewart of equestrianlandia! Wow! 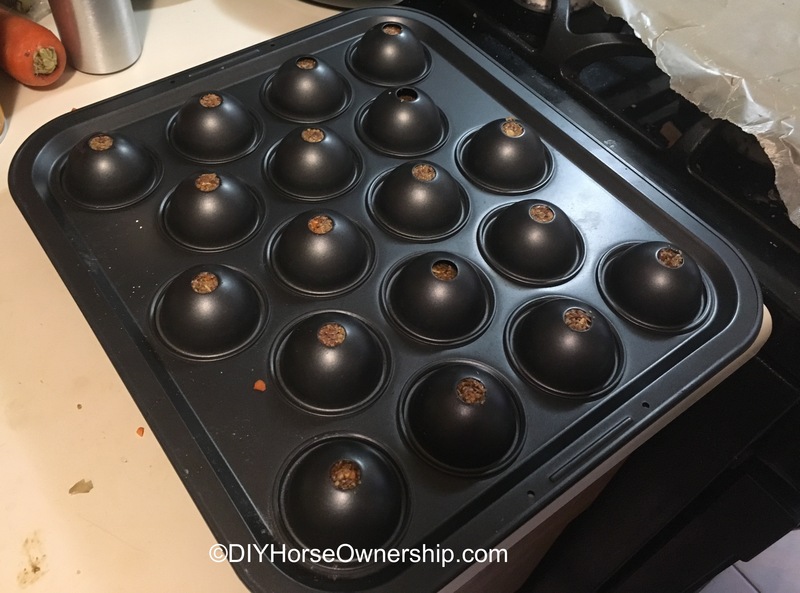 I didn’t even know they made cake pop pans. And where on earth did you buy candy canes in July? Kudos to your creativity and dedication to horse snacking. I actually just bought peppermint and green apple flavored candy sticks from a candy store. But I’ll probably save some candy canes for this next year.